Iron Design wanted to turn their existing office into a contemporary space with a focus on clean lines and an open, connected, flexible office with a touch of design flare that spoke to their creative energy. To achieve these goals, Trade Design Build cleaned out the existing partitions and installed a new hardwood floor throughout. Gray walls, white trim and a hickory floor provide a simple and clean backdrop. Most offices are characterized by their mundane office furniture; for Iron, the focus is on the furniture. Trade Design Build designed and built custom sit/stand desks, mobile storage units, and three large, mobile hybrid storage/work tables to meet the client’s need for long-term flexibility. A slim, modern, Baltic birch shelf and metal accent band provides product display and draws visitors into the office from the entry corridor. 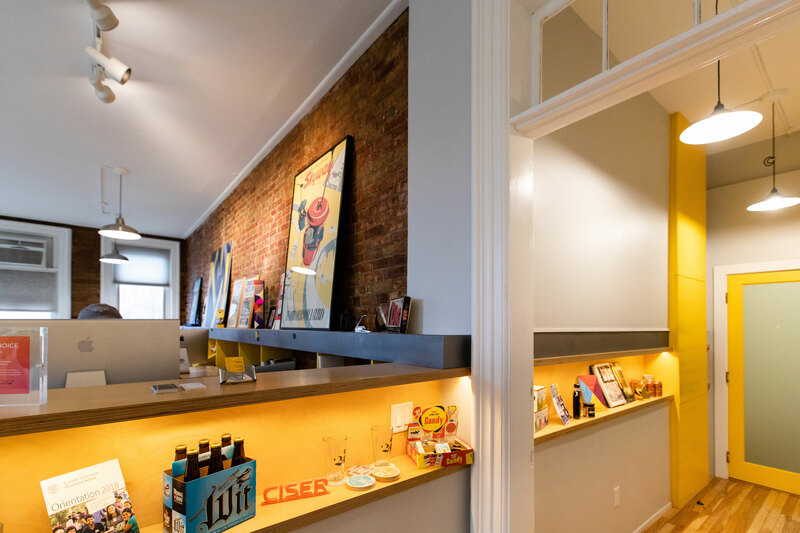 Bold yellow accents in the canted shelving and on the conference room door frame provides a buzz that compliments the design energy of the studio.